A twelve-hole roman fantasy set in spectacular scenery. 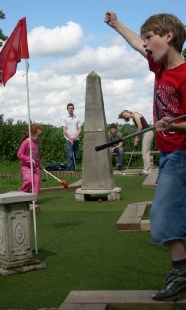 We love miniature golf - it’s a highly competitive sport, and this course is a real leveller so you never know who will win. Where else can children beat their parents with a club in a fair contest? We have special clubs for infants, so with a little leadership a two-year old can play. This is an outstanding outdoor course with all-weather artificial-turf fairways. The design unites a picturesque roman ruin theme, retro minigolf style and adventure golf features for ultimate playability for all ages. 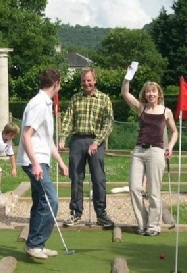 The course is unusually accessible for wheelchair users and ball-lifting aids and soft putters are available. Customers of the aMazing Hedge Puzzle or the Wye Valley Butterfly Zoo get all their rounds at half-price.